Enjoy an adrenaline-fueled day on this Outdoor Adventure tour. An ecological rollercoaster ride fully loaded with excitement, challenges, and non-stop fun. Experience a 007-style speedboat ride, some 4×4 Off-road fun, a mule-ride up a mountain and the adrenaline rush of zip-lining. Your expedition begins with an exhilarating speedboat ride whisking you to Boca de Tomatlan, a secluded beach at the edge of the jungle on the southern shores of Banderas Bay. Hop on an incredible 4×4 Mercedes Benz Unimogs that will take you on an exhilarating off-road expedition 2,000 ft. above sea level to our base camp deep into the heart of the Sierra Madre Mountains. Next, accompanied by our expert guides, and now fully equipped with a harness, your mule is ready to take you on a thrilling trek up the mountain. 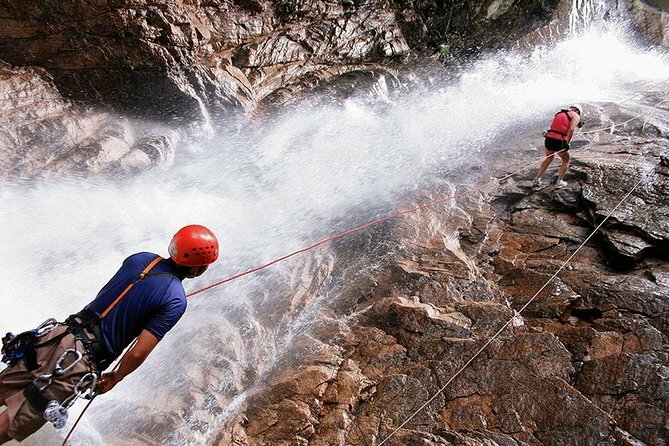 To get back down feel the adrenaline rush as you fly through a series of zip-lines 1000 ft. long and 250 ft. high, rappel down waterfalls, traverse jungle bridges and finally splash into a natural river pool.